Learn about key snowmobile controls along with various parts and fluids important to safely operate your snowmobile. Note: this section is not a substitute for reading your snowmobile's owner's manual to understand exact details about operating your particular snowmobile model. The throttle is located on the right handlebar. 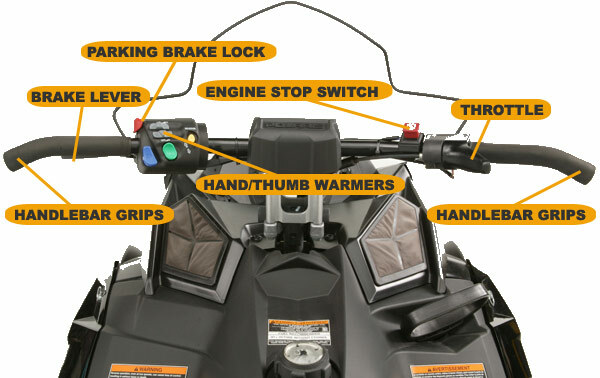 Grasp the handlebar grips and squeeze the throttle with your thumb to start moving the snowmobile forward. The harder the throttle is squeezed, the faster the snowmobile goes, so vary how much pressure you apply to the throttle based upon your desired speed. When the throttle is fully released, the snowmobile will coast to a complete stop. The brake lever is located on the left handlebar. When squeezed it applies pressure that slows the snowmobile's track. 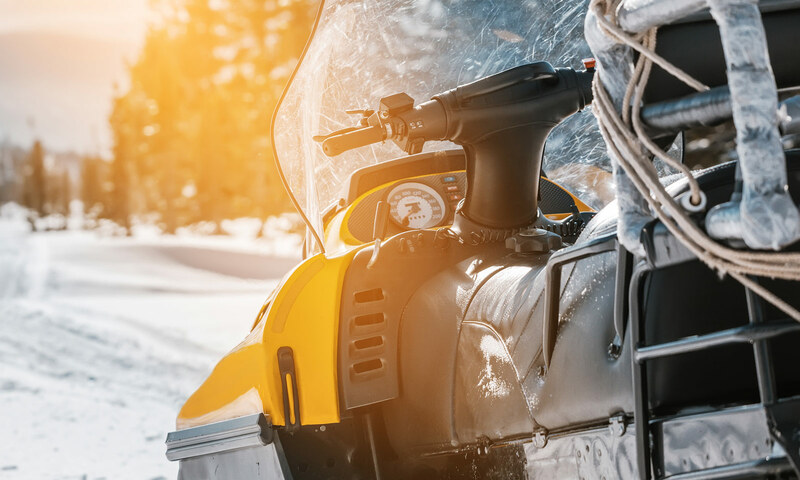 If clamped on too hard, it can lock up the track and potentially cause you to lose control of the snowmobile—especially if you're operating on ice or slick trail conditions. Always apply only enough pressure to the brake lever to safely slow or stop according to your riding conditions, while trying to prevent totally locking the track. The parking brake lock is located at the end of the brake lever, near where it attaches to the handlebar. It is typically a small lever to push in, or a toggle clip that can be inserted into a notch in the brake lever. To set the brake lever, pull the brake lever fully toward the handlebar grip and push in the clip. The snowmobile cannot be moved once the parking brake is engaged. Do not apply the throttle when the brake is set to avoid damaging the snowmobile's drive belt. To release the parking brake, squeeze the brake lever to release pressure and then move the brake lock to its disengaged position. Always check to ensure the parking brake has been disengaged before unloading from a trailer, when initially beginning a trip, and when continuing from a stop during your trip. The emergency engine stop switch, or "kill switch," is located on top of the handlebar to the left of the throttle. It allows the operator to quickly stop the engine by pushing the switch button down. The engine cannot be started if this switch is left in the "down" or stop position, so make sure the switch is in the “up” position before trying to start the snowmobile. Grips are located on the right and left sides of the handlebars. They are designed to absorb vibration and provide traction to help keep your hands on the handlebars when riding and steering. The handlebar grips contain electric heated hand warmers while the throttle control on most sleds contains an electric heated thumb warmer. Most hand- warmers have a couple of temperature settings and an "off" switch while thumb warmers typically have only an on/off switch to adjust your needs. Hand/thumb warmers controls are generally located on the handlebars or may be located on the console area of some snowmobile models.